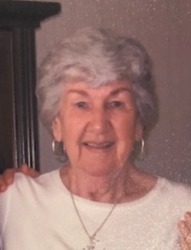 Hedwig “Katy” Invernale, 89, a longtime Eatontown resident, passed away November 12, 2018 at Riverview Medical Center. Katy was born in Hochdorf, Germany to Max and Ida Katz. Katy came to the United States in 1955 after marrying her husband who was serving in the US Army overseas. She was a hard worker dedicated to keeping her home, raising her son and working as a waitress at the Monmouth Queen and Perkins Diners in Eatontown. Katy loved knitting and making beautiful items for others. She also enjoyed playing Bingo and visiting her family in Germany yearly. .
Katy was a communicant of St. Dorothea’s RC Church. Katy was predeceased by her parents, sisters: Else Thumm and Irmgard Oechsle, sisters-in-law; Marie Invernale and Dolores Cosentino, and in 2012 by her beloved husband, Frank F. Invernale. She is survived by her loving son, Frank and his wife Laura of Old Bridge, brother-in-law, Anthony Cosentino of Brooklyn, NY, as well as, many nieces and nephews, both here and in Germany.